... and I tuned in during the 4th quarter. Amazing that there's been so many TDs and first downs here, but not so much in the previous three? I'm enjoying this game. I don't usually watch NFL. Balls. That KC D won't make the stop. But the Pats running game has been absent since Q1. Last edited by Marshall Banana on Mon Jan 21, 2019 4:14 am, edited 1 time in total. Well they saved me money on going downtown to Super Bowl festivities, not gonna root for either of these teams. That game and in particular, that fourth quarter deserved a better finish than a coin toss. I don't watch religiously but I do enjoy finals time. Couple of great games today. Yep, that's the opportunity that's allowed me to watch it! Gronk was at his best again. And Edelman is just incredible game after game. Much respect to the Chiefs though. How do you go to sleep now? I have to be up in 2.5 hours! He nails pretty everything before it happens like that huge 3rd down to Gronk. Maybe he missed his calling as a defensive co-ordinator. Never thought about it before but a QB-turned-defensive coordinator could be a pretty brilliant idea to try. He should spent the whole offseason doing a Mr Miyagi on Jason Witten. It seems about right that the Pro Bowl gets Witten and the Superbowl will have Romo. Big question this week is, how injured is Todd Gurley. I'm not buying the notion that he only got 4 snaps against the Saints but wasn't playing hurt. If the Pats win on Sunday it will be Brady for MVP. If the Rams win, it will be Aaron Donald. I have a feeling #99 is going to have himself a game (but I'm usually wrong). If he did win MVP he'd become the first defensive tackle to ever win it outright. There is more to the Todd Gurley thing than they're admitting to. People get like this with all teams, in any sport, who have a prolonged period of success. DBs all seem to have that sort of trash talking attitude. On a team with Marcus Peters and Aqib Talib it's not that surprising that Robey-Coleman has begun acting like Jalen Ramsey. I groaned when I saw it because, yes, it's bound to blow up in his face. He'll likely be covering Edelman over the middle for much of the game. Yikes. I know every year has intriguing match ups but these 2 teams are such contrasts. The oldest coach against the youngest (half his age! ), the oldest QB against the youngest ever NFC representative. A star studded dynamic, fast but undersized Rams defensive front against a no-name, physically huge Patriots offensive line. Brandin Cooks against the team he can't remember playing for in last year's game. This is almost certainly Gronk's last game of football. That makes me very nervous. I think Sean Mcvay will likely be the next Bill Belichick. I watched the All Or Nothing documentary on Amazon about the Rams and what he's done is incredible. I'm a huge Edelman fan. 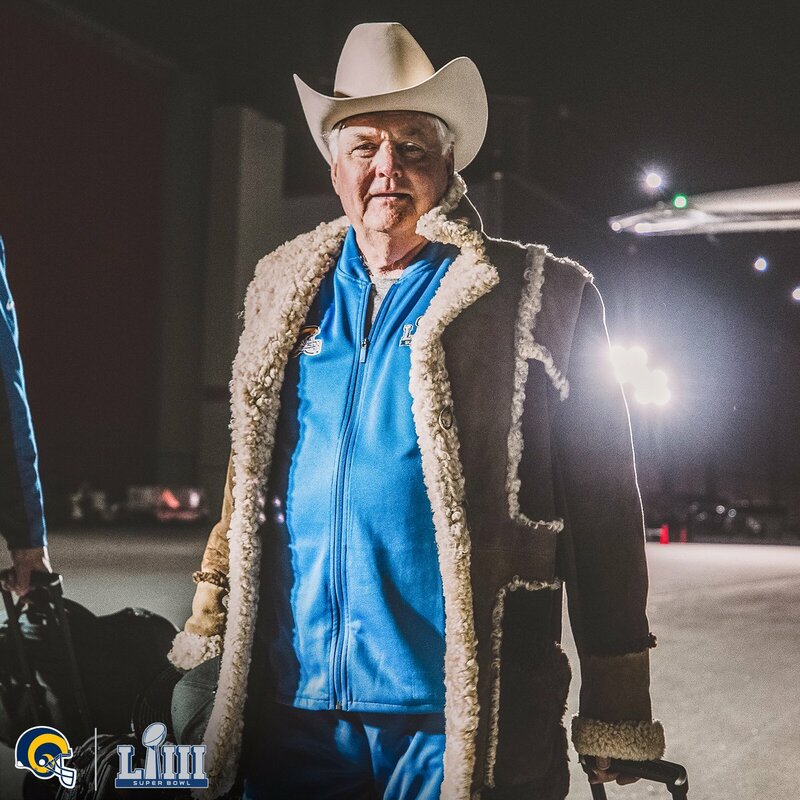 Meanwhile the Rams unveil their secret weapon: JR Ewing. DBs all seem to have that sort of trash talking attitude. Once heard a football player say (I think it was Mark Schlereth, who was an offensive lineman) that the further away from the snap of the ball you are, the more trash you talk. If there’s one reason to root for the Rams, it’s Wade.